A trip to the beach is easy with little kids. Pack sunscreen, a bucket and shovel and let kids play till they can’t play anymore. Teens, not so much. A day or two on the beach, maybe, but they aren’t likely to find building sand castles for a week as entertaining as little ones do. —> Read our handy guide for beach bag essentials! 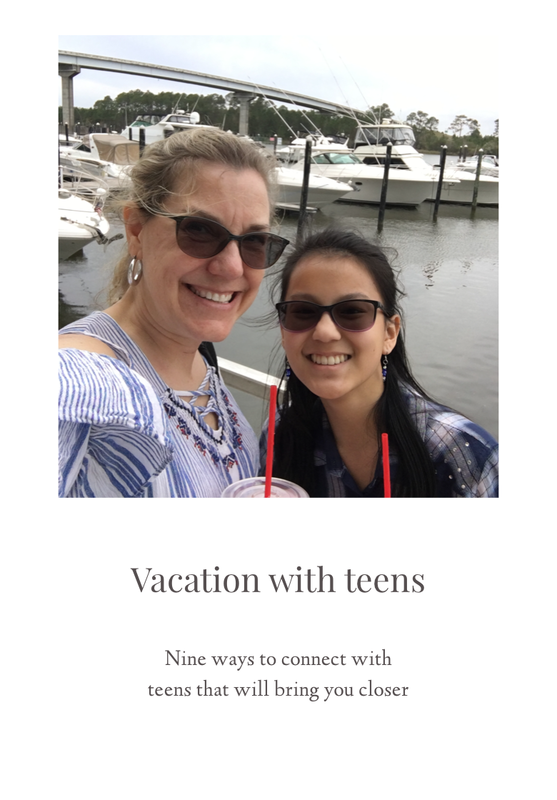 And since vacation is a great time to connect with teens without the hectic schedules, finding fun activities to do with teens at the beach is a solid idea. You know, find fun things for teens to do and join them in it. I’m truly amazed at how my own kids open up when I am willing to join in on activities for teens. Ellie, who’s almost 15, and I just went to Gulf Shores and Orange Beach, Alabama for a mother-daughter weekend. Some of my friends wished me luck, but I didn’t need it! 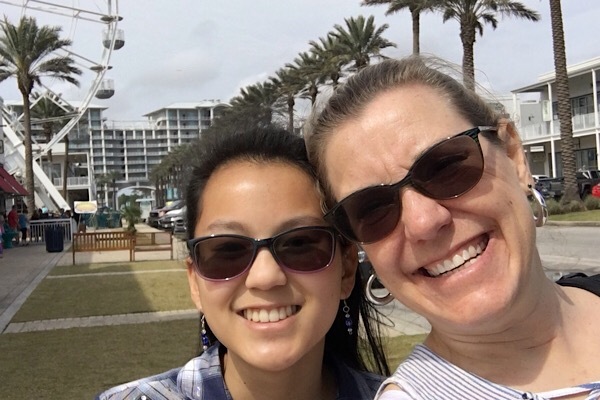 There’s so much to do around Alabama’s beaches, I picked activities for teens geared toward her interests and made lasting memories with my girl! Travel planning tip! Include things kids like when planning vacation, and you’ll always have a great time! Here are the things I found and why I think they worked so well for us. When planning your vacations, look for activities to do with teens at the destination, and add some to your itinerary. When you add fun activities for teens, they’ll relax, open up and share what’s on their hearts. While this post focuses on fun things for teens to do in Gulf Shores and Orange Beach, you’ll find similar types of activities for teens other places, too. If you google “fun things for teens to do near me,” you’ll find a long list even if you’re close to home! Ellie is not quite old enough to drive, but she’s excited to learn. 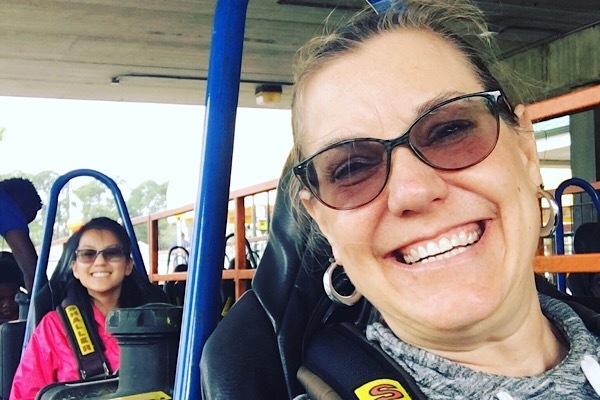 So, we headed to The Track, a go-cart and arcade place in Gulf Shores, to test her driving skills. She loved it! The first race, I blew her out — I’m a nice mom, but I’ll always be competitive. Over the next three races, it got much harder to beat her. The Track in Gulf Shores has two tracks, the close race track near the arcade and the Wooden Track across the parking lot behind the putt putt golf course. The wooden track is a little more expensive and a lot more fun! You climb the circular track which requires some skill, then soar down the hill, around a bend and do it all over again. Ellie gave it a hearty two thumbs up! Ellie wanted to try the Sky Coaster (a bungee thrill ride), but it wasn’t open the day we went. We were also disappointed that they don’t have traditional pinball games, but we had a blast playing Ms. Pac-Man and Whack a Minion! Best advice, don’t watch. Ride! Ellie saw a few other parents watching their kids ride and took my hand. “Thanks for riding with me, Mom.” Priceless moment! Teens and bikes are a great combo! Rent bikes and explore the area on two wheels. 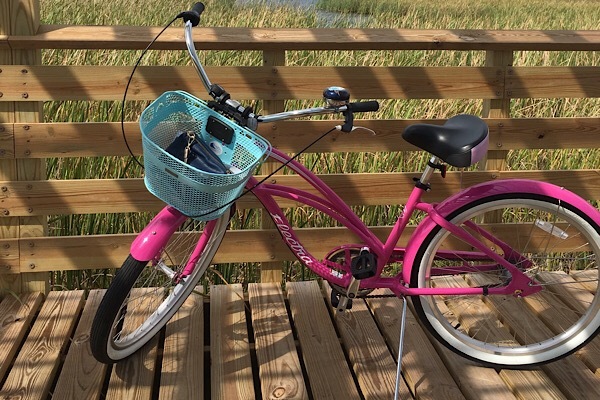 We’ve rented bikes at Gulf Shores, at Hilton Head Island in South Carolina and at Jekyll Island in Georgia. For some reason, bikes and beaches go together like sand and sea! For me, the slower pace is appreciated. But, there’s also a sense of spontaneity that seems to go with biking. See an ice cream shop? Stop. Enjoy a cone. And the conversation. Worn out? Drop the kick stand and plop down in the sand to watch the waves. Then listen. You’re likely to hear stories you wouldn’t get if you rush around in the car. Look for bike rental companies that include helmets. And, many companies offer discounts when you book online. Even if you can’t find a coupon, compare prices. The price of a weeklong rental is usually not much more than the cost of a daily rental. Or maybe not… but a round of “real” golf or a round of putt putt is a great way to spend time together. We play miniature golf just about every place we go, and now that the kids are older it’s more fun. Play the way 18th hole as winner takes all. There are so many ways to make it more “interesting,” and create some funny moments. 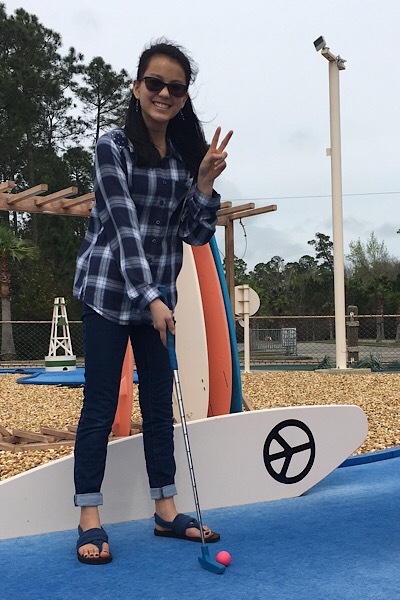 In Orange Beach, Ellie and I played putt putt at The Wharf. I won the game, except we played “winner takes all” on the last hole, and Ellie beat me soundly! Since the course wasn’t crowded, we didn’t rush through the course, but stopped to take silly photos along the way. It was so nice to have no agenda and no need to rush! Shopping centers like The Wharf at Orange Beach are fun places to go for teens. The key, though, is not to rush it. When you’re looking for activities to do with teens, make it fun and slow down. They relax when you do, and they’re more likely to open up. Not that doing activities for teens should be focused on those deep conversations, but if you can break down some barriers and earn a genuine smile, that’s good. Right? When we were in Alabama, Ellie and I wandered through shops, picking out outfits for each other, trying on hats, and looking at jewelry. She found a cute necklace but didn’t have enough of “her money” to buy it (don’t tell her — I bought it secretly and will give it to her on her birthday). She found a dress for me that I absolutely loved but wouldn’t have chosen on my own. Along the way, we also saw some wacky things that made us laugh. Who buys this stuff? When you travel with teens, ask them to pick some of the restaurants. They’re savvy and know how to navigate Yelp better than you do (probably), so let them choose a few places. They’ll pick restaurants that look like fun places for teens, and you’ll likely discover something new. 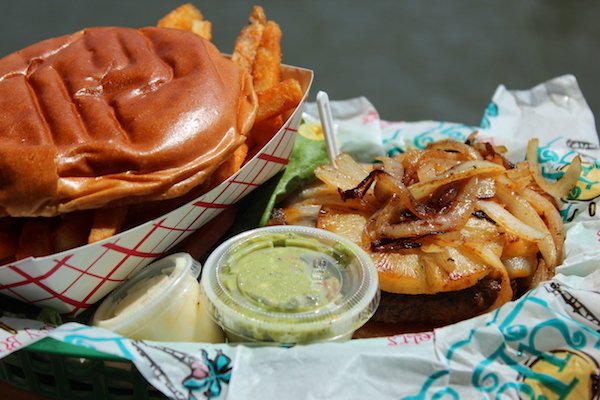 In Gulf Shores, Ellie chose Picnic Beach for dinner one night. It was so different — with astroturf flooring, board games and eclectic decor. The food is fresh, organic and unusual. Ellie got a bison burger and LOVED it. Turns out, it was my favorite place we ate the whole trip, too. Every beach town I know has a festival (or two or three or four) every year. Ellie and I happened to be in Alabama during their Festival of Art. So, after a delicious brunch, we strolled over to the festival and wandered among the booths. Ellie makes her own jewelry, so we lingered at jewelry maker booths. She’s also a trumpet player, so the sculpture artist who uses old instruments to make fountains caught her eye too. We stopped at the hot glass demonstration barn and watched a man make a vase. I’ve made hot glass pieces before, so while it was interesting, I would have moved on. Ellie wanted to see how it turned out, though, and I stayed. It was fun watching her as the vase took shape! We didn’t have a rushed schedule (key when looking at things to do with teenagers), so we chatted with the artists and learned about their crafts. 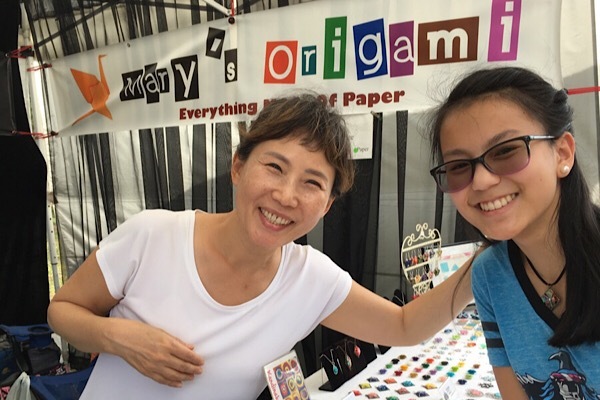 Ellie visited every booth and went back to the Japanese origami artist who made jewelry from paper. They chatted quite a while and Mary, the artist, selected a necklace for Ellie. She has worn it every day since! Anyway, Ellie and I went to OWA Foley, the only roller coaster park in Alabama, and whirled, twirled and swooped through the air until long after dark. Her favorite ride, Twister, was a bit too intimidating for me. Thankfully, she let me skip it so I could make a video for the blog. I rode the coaster, though! Since it was just us, she got to pick rides without having to take turns with her brothers. 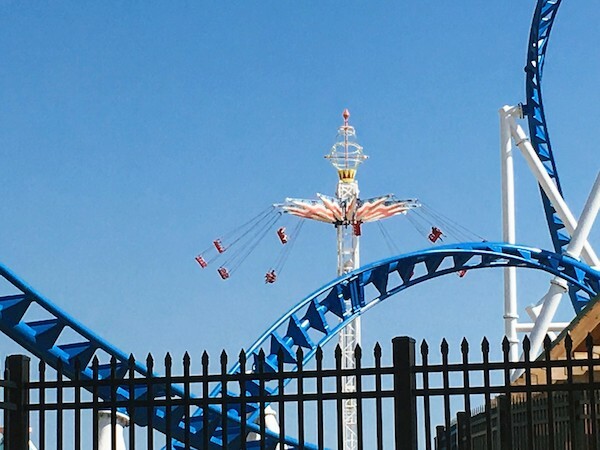 She rode the swings — really high, really fast — three consecutive times! Before the last one, she ran to me, eyes sparkling, “There’s no line. Can I go again?” The grin when I said yes was worth the price of admission. How awesome to say yes! Especially when this was one of the most fun activities for teens in the Gulf shores area — at least according to Ellie. Ellie has never been to a “real concert,” so when the Amphitheater at The Wharf invited us to attend the Zac Brown Band concert as their guests, we had to say yes! We aren’t huge country music fans, but we know a few ZBB songs. During the cover band and break between bands, we took silly selfies (none all that good). And Ellie pointed out outfits and hairstyles she liked as people passed. I got a good sense of her taste! She also asked a lot of questions about tough stuff. As one guy walked by carrying a few beers, she asked about alcohol and if it’s dangerous to drive after concerts. She asked my opinion of e-cigarettes (apparently they aren’t banned in this venue). I asked her about drinking and drug use at her school and got honest answers. She’s in 8th grade, and she knows kids who use drugs at school. She thinks it’s both sad and stupid that kids think they won’t ruin their lives. 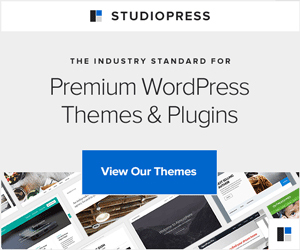 When I started this post, I expected it to be a list of things to do and fun places for teens in Gulf Shores and Orange Beach. But, while I think there are some summer activities for teens that families might want to know about, it’s even more important to know how to have fun WITH teens. Pick activities to do with teens that yours will like. Go at their pace. Life is busy enough, so slow down and enjoy the time doing things they like. Give them a say. Ellie picked dinner one night. She chose the souvenir at the Festival of Art that “spoke” to her. Teens have so many rules to follow at school — both official written rules and unspoken social constraints. Let vacation be a vacation from the stress! Enjoy it! This trip with Ellie was our best one yet. The first day, I had to discipline myself to “mom less” and “enjoy more.” But, as the trip went on, I really got into the friend mode with her. We had a blast! Escaping everyday life, with all its rules and parenting requirements, Ellie and I got a chance to enjoy our trip. We focused on fun activities to do with teens, and I discovered that my little girl is a lot closer to all grown up than I thought. Such great ideas, and actually makes me a little excited for the teen years!